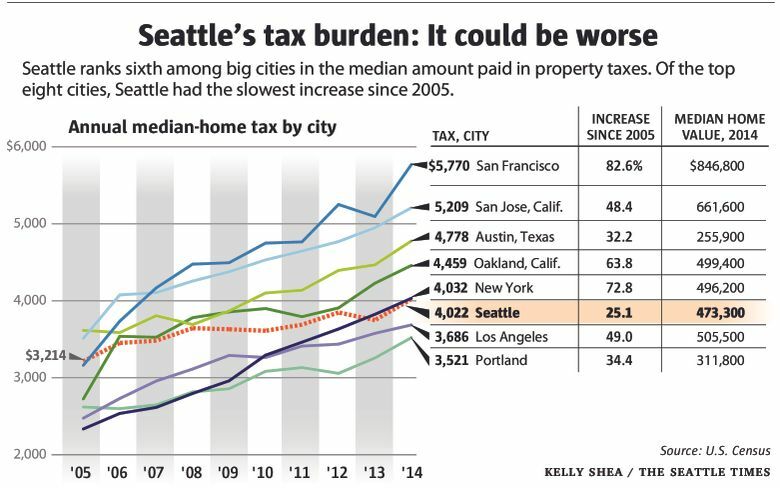 Seattle property taxes: Are we gouging ourselves? According to census estimates, Seattle ranks sixth among the 50 largest U.S. cities for the median amount paid by homeowners in property tax. That figure hit $4,022 last year — an increase of $808 since 2005. How much is too much when it comes to property taxes in Seattle? If there’s one topic that readers have asked me to address more than any other over the past few months — that’s it. And now we have some new numbers: The Census Bureau just released data on residential property taxes for U.S. cities in 2014, so let’s have a look. A main driver of that increase is a host of property-tax levies approved by voters over the years. The city has become more reliant on these levies recently. Local officials attribute that to the state restrictions on legislative property-tax increases (You can thank Tim Eyman for that). And next month, Seattle voters will be asked to approve the biggest levy yet — the $930 million Move Seattle transportation package. The proposal includes numerous projects to relieve traffic congestion, improve safety and chip away at our backlog of street repairs. It would replace the expiring Bridging the Gap transportation levy and cost $275 a year to the owner of a $450,000 home, according to the city. That increased property-tax burden is what’s troubling to the readers who’ve contacted me. It’s also among the reasons the League of Women Voters of Seattle-King County has urged a “no” vote on the measure (the proposal has also won many endorsements from a wide range of organizations). Clark shouldn’t lose any sleep over the relatively well-off, but here’s a legitimate concern: Some Seattle homeowners are not even close to being well off. Of the city’s home-owning households, one in five has an annual income of less than $50,000, the census shows. They’re house-rich, cash-poor — the same story I heard from readers. Many of them bought their homes years ago, in neighborhoods that were modest at the time, but have since become fashionable. Their homes may have skyrocketed in value — and their assessments with it — but their earnings haven’t kept pace. Some are retired and on a fixed income. But back to the original question: Is it too much — are our property taxes approaching “unmanageable levels”? If you’re talking about property-tax rates — no, according to a study by the city government of Washington, D.C. It compared the property-tax rates for the largest city in each state and the District of Columbia. Seattle had an effective rate of 94 cents for every 100 dollars of assessed value in 2013, ranking us only 38th out of 51. Seattle property taxes are high because our homes are worth so much, not because we’re being gouged by an excessively high rate. In Northern New Jersey, where I’m from, property also is expensive — but tax rates have always been among the highest. My mom doesn’t live in New Jersey anymore, but I asked her what she paid before she left. In 2008, the year she sold her $400,000 house, her property tax was more than $8,000.